QUESTION #2: If a child misses a therapy session due to absences, assemblies, field trips, etc. do you try and make up the therapy session? 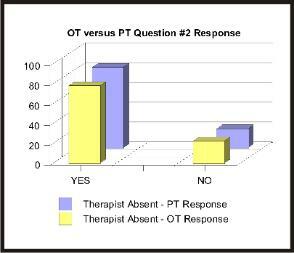 QUESTION #3: If you are absent and students miss therapy sessions, do you try to make up the sessions? If a child misses a therapy session due to absences, assemblies, field trips, etc. do you try and make up the therapy session? If you are absent and students miss therapy sessions, do you try to make up the sessions?